Castlebay has been musically weaving together the heritage of New England and the Celtic lands since 1987. Members Julia Lane and Fred Gosbee have loved and researched traditional music for most of their lives and blend history, legend and experience into their personable performance style. Their concerts feature poignant ballads sung in Lane’s ethereal soprano and Gosbee’s rich baritone interspersed with joyous dance tunes played on Celtic harp, guitar, fiddle and tin whistle. Castlebay treats the audience to a musical journey through time and across the Atlantic. 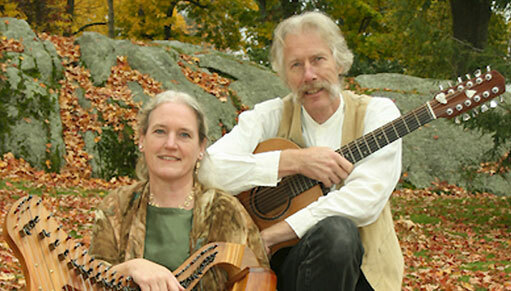 The duo also presents special theme concerts on various aspects of Celtic lore, nautical life or Colonial America. Castlebay has toured the eastern US, Maritime Provences, Great Britian and Ireland. Their first tours of Scotland in the early 1990’s were organized by the traditional singer, Jack Beck. Over the years they have met and collaborated with many fine Scottish musicians including members of Heritage, Geordie MacIntyre, Alison MacMoreland, Stravaig, and the late Lionell McClelland. While much of the Scottish music they perform is traditional, they have also been moved to write major pieces about places they have visited including the Isle of Skye and Dumfries & Galloway.